“On an Apple being lifted, Hercules shoots a Dragon which hisses”, “Notes produced from several Birds in succession, by a Stream of Water”, “ A Vessel for discharging Liquids of different temperatures at pleasure”, … these are only few of the fabulous pneumatics of Hero of Alexandria you can find on a poster that comes with our latest publication titled Giraffes, Telegraphs, and Hero of Alexandria. You wonder what all this has to do with architecture? 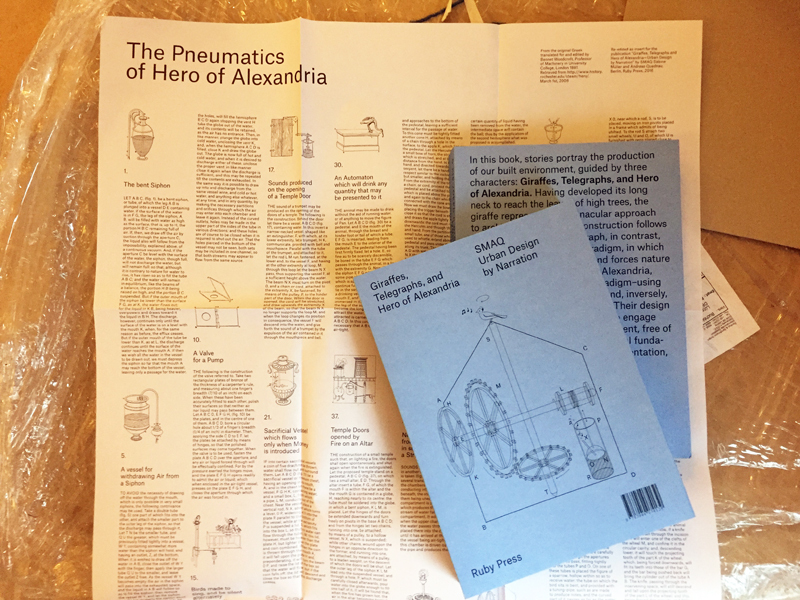 For editors Sabine Müller and Andreas Quednau from Berlin based architecture office SMAQ the giraffe, the telegraph, and Hero of Alexandria reperesent three key concepts of how to approach our enviroment. Having developed its long neck to reach the leaves of high trees, the giraffe represents the vernacular approach to architecture, in which construction follows forces of nature. The telegraph, in contrast, embodies the modernist paradigm, in which technology reigns supreme and forces nature to adapt. 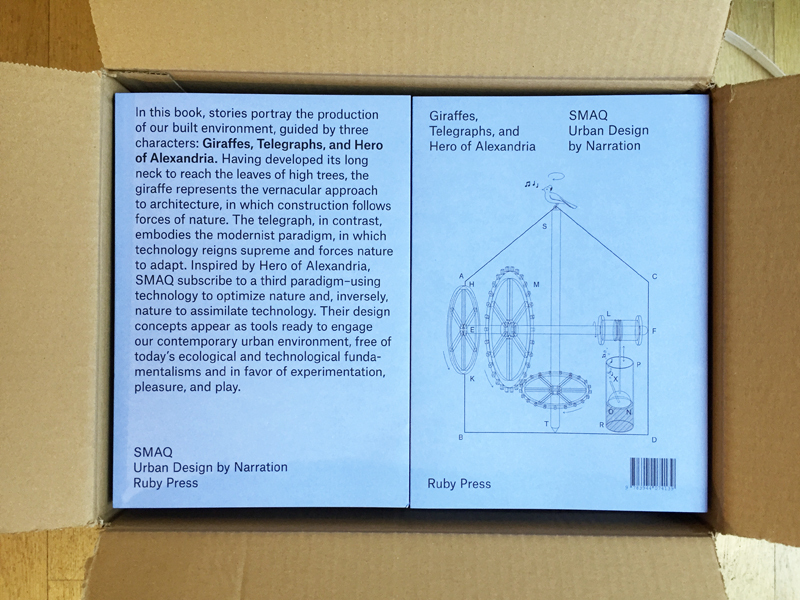 Inspired by Hero of Alexandria, SMAQ subscribe to a third paradigm – using technology to optimize nature and, inversely, nature to assimilate technology. The book is a collection of 13 architecture and urban research projects told as stories. Sabine Müller and Andreas Quednau explain: “Because stories, to borrow the language of Michel de Certeau, carry out the labor that transforms geometrical, abstract space into a lived space, and because a project should offer the interpretational openness of fiction”. Complemented by photos, drawings, and diagrams the narratives guide you through contested contexts as diverse as Dubai, Beijing and Halle/Leipzig, revealing otherwise invisible forces contemporary urban design may utilize. Their design concepts appear as tools ready to engage our contemporary urban environment, free of today’s ecological and technological fundamentalism and in favor of experimentation, pleasure, and play. With contributions by Theo Deutinger, Rodney LaTourelle, Sabine Müller, Caroline O’Donnell, Andreas Quednau, Deane Simpson. 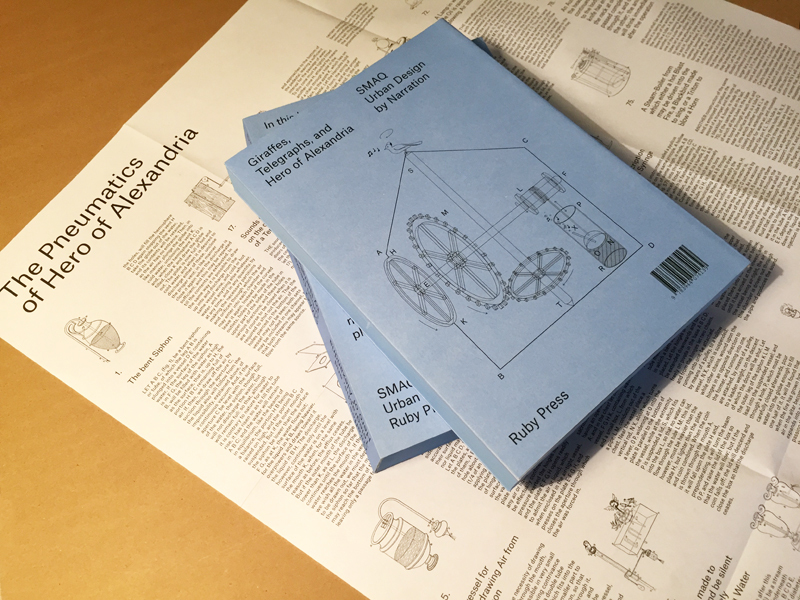 Available in our webshop now and soon at your local bookseller.